It’s going on 14 months now since we last caught wind of Lionsgate’s planned Borderlands movie, but according to Randy Pitchford, the adaptation continues to simmer in pre-production with Aaron Berg (G.I. Joe, Section 6) and the team still in the process of developing scripts. Chatting to Geoff Keighley on YouTube Live at E3 (via Gamezone), the Gearbox CEO also confirmed that Lionsgate’s big-screen adaptation will be rooted in the Borderlands universe – an irreverent, zany space western that is arguably one of the more rich universes in gaming – while still featuring a self-contained story that isn’t beholden to the franchise’s canon. It’s still early, early days, as evidenced by Pitchford’s hesitancy to divulge anything too specific. Nevertheless, a live-action Borderlands movie is on the way, and with the runaway success of R-rated comic book movies (see: Deadpool, Logan), there is perhaps no better time to mine Gearbox’s video game series for cinematic content. We’ve been developing scripts and the strategy that we’re on right now is that it’s obviously all in the Borderlands universe but rather than retell the stories that were in the game, we’ll create new stories so the films will have their own film canon. We’ll use all the characters and scenarios, it’s similar to what Marvel is doing. You can’t read any particular film plot in a comic book but there’s a lot of the characters, themes, and in fact, some of the situations are represented. 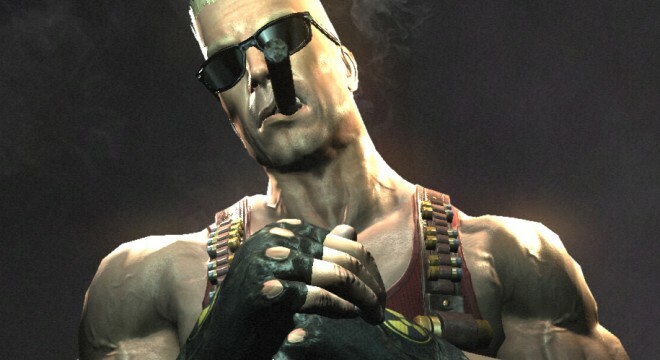 Not only that, but it seems the studio is also beginning to make headway on a Duke Nukem movie. That’s surprising in and of itself, given the DN brand was dealt a heavy blow with the launch of Duke Nukem Forever in 2011 – after years spent languishing in development, the video game reboot was ostensibly dead on arrival. But according to Randy Pitchford, a new movie featuring the cigar-chomping monster hunter could be on the horizon. Hail to the king, baby? We’re working on that! I can’t announce it but it’s blown my mind, there’s been a lot of production companies that have come at us. We’re putting together a deal right now with a major motion picture studio, I’ll tell you off the record if you want to know. It’s the exact right people that should be doing a Duke Nukem film and we’ll see what happens. It’s unbelievable, I think that’s very likely to be a thing. With a track record filled with botched adaptations (Assassin’s Creed) and unmitigated disasters (Super Mario Bros.), it’s a wonder Hollywood executives are still willing to approach video game properties with a ten-foot pole. And yet, that’s exactly what’s occurring, given we now have Tomb Raider and The Division to look forward to in the not-so-distant future. Both Borderlands and the embryonic Duke Nukem movie are naturally further out, but we’ll be keeping you right up-to-date as more information comes to light.